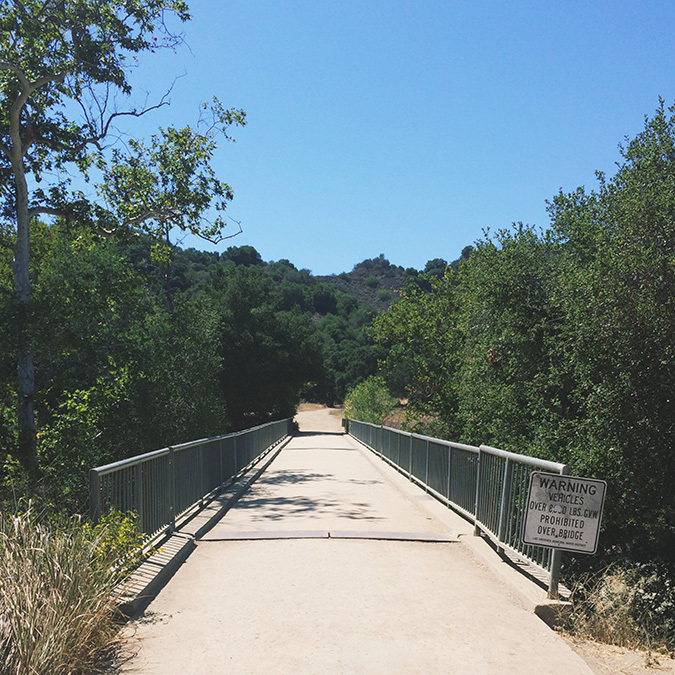 Malibu Creek State Park is one of many incredibly beautiful hiking areas in the Santa Monica Mountains. This park is the previous location ranch of 20th Century Fox studios who owned the land between 1946 and 1974. They shot a number of different TV shows and movies here including M*A*S*H between 1972 - 1983 (more information here). There are a number of different trails you can wander off on in this park, but for this particular post I'll be discussing Crags Road (the lower part of the canyon) - the trail that will lead you out to the M*A*S*H Set Location! This hike was about 2 hours, and ended up being a round trip of 6 miles - but I think that's mostly in part due to a couple of our missteps in our directions and some exploring. Typically, this hike toward the set location and back should only run you about 1.5 hours and end up being between 4.5-5 miles roundtrip. Malibu Creek State Park is located in the Malibu Canyon (detailed directions are listed below). When you enter the park you will need to stop at the ranger station and purchase the parking pass which is $12. After you purchase your parking pass head down to the furthest parking lot. Here you will find some bathrooms and a few drinking fountains. After you park, make your way back to the road you drove in on. There you will find a marked entrance leading you down to the backcountry trails. Follow this path and almost immediately you'll find yourself crossing a bridge over the creek. We happened to come on a very busy Fourth of July weekend - it was super busy and there were a lot of families swimming and playing in the water below. Once you cross the bridge you will continue on the fire road past the Grassland trail on right until you meet an intersection. You have two options here that will essentially drop you off in the same spot. Your first option is to take the Low Road to the left over the creek. Your second option is to follow the High Road on the right that continues on in a more shaded area alongside the creek. We decided to take the Low Road on our way in to the canyon (and we took the High Road on our way back to the car - we needed the shade!). As I said, this path will take you over the creek - however, at this point in time we're in the middle of a drought so unfortunately there wasn't much creek to be seen here. After you pass over the creek you will eventually find yourself at the Visitor Center and yet another bridge that crosses over the creek. Follow the bridge, ignoring the dirt paths on your left. Continue on straight, past the High Road on your right, and follow the trail that ascends up into the hills. This path will continue to climb offering you some really great views of the Grassland hills and Goat Buttes. At this point, if it's a busy weekend you're sure to hear playful yelling from the creek and the dam below. The trail will begin to descend once you past the steep Lookout Trail. When you get to the bottom of the hill you'll see a path to your left marked Century Lake and another path pointing towards the Forest Trail ahead. Ignore the Century Lake trail for now and follow the path ahead of you pointing you in the direction of the Forest trail. Eventually you will come upon another bridge crossing the creek. On the other side of this bridge, the trail splits - follow the Fire Road as opposed to the smaller trail that splits to the left. This fire road will continue to lead you on to the MASH site (you will see a MASH trail marker not far from here). This is where the route begins to narrow and becomes a single-track trail leading you over a rocky creek bed. You will follow this path for about 3/4 of a mile. Keep your eyes on the trail here - you'll have to do a bit off rock hopping as you make your way. As you make your way out from the shade and on to the M*A*S*H Set Location the first thing you will see is one of the old medic trucks. There are more old rusted out trucks, and posts with images and information throughout the site offering a nostalgic look back on this iconic TV show. We stayed and explored here for a little while - hiked up to the old helicopter pad which offered a great aerial view of the set below, and investigated a couple of the other off-shoot trails near by. Apparently you can follow Crags Road even further - but due to the heat and our previous struggles we decided to head back the way we came. On your way back, if you feel like exploring a bit more, you can head down to the Century Lake Dam (this is the path I told you earlier to ignore). The views at the dam are really nice, and I'm sure on a quieter weekend much easier to enjoy. We worked up a serious sweat on this hike - so I think if you're not planning on taking a dip in any of the rock pools, it's probably best to come in the cooler months. Make sure to pack a whole lot of wage and lather on the sunscreen and the bug spray. There are a lot of bees and mosquitos - I ended up with a few bites even after putting my own bug spray on. It's also smart to be mindful of ticks - especially if you make your way through the Grasslands trail. I didn't see any on this trip, but we checked each other afterwards just to be safe. How To Get To The Trail Head: Malibu Creek State Park can be located from either the PCH (follow Malibu Canyon Road inland) or 101 Freeway (follow Los Virgenes Road toward Malibu). From the PCH the park entrance will be on you left. From the 101 the park entrance will be on your right. There is a $12 parking fee per car to enter the park. If you don't wish to pay the parking fee, there is apparently parking along Mullholland and Los Virgenes and you can follow the Grassland Trail into the park.